New for 2016, the Wilson Combat/Beretta 92G Compact Carry features sought after custom Beretta parts and features, specially selected by Bill Wilson to enhance performance as a concealed carry pistol. Click here to purchase the 92G Compact Carry. 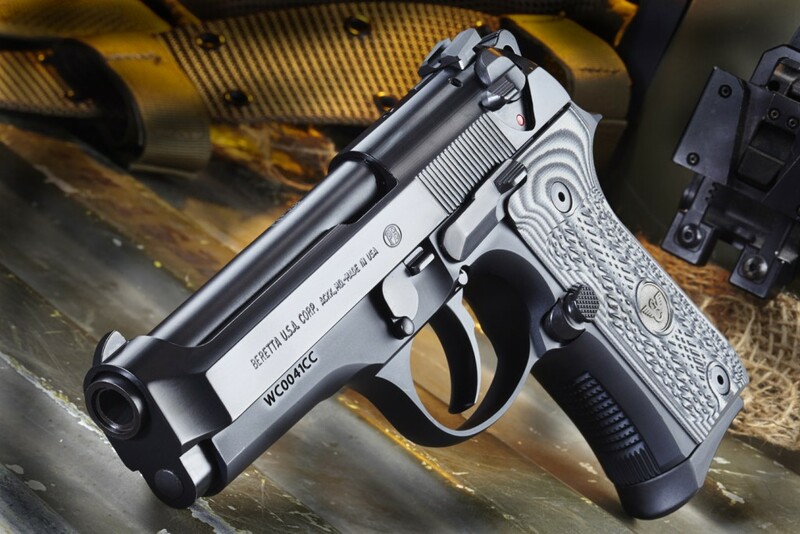 Some features of the limited Italian production Wilson Combat/Beretta 92G Compact carry include steel ambidextrous decocker-only levers, a checkered compact frame with rounded trigger guard, beveled magazine well and Wilson Combat G-10 grips. A steel guide rod and extended steel magazine catch improve handling while the match-grade, blackened stainless barrel with recessed target crown ensures match-grade accuracy. The 92G Compact Carry also features a 16# hammer spring for lighter trigger pull weight, a white dot integral front sight and a Wilson Combat rear battlesight. The 92G Compact Carry is finished in Beretta black Bruniton coating and marked with the Wilson Combat logo and is specially serialized to ensure its place in Beretta history. The 92G Compact Carry has been optimized by Beretta to meet the needs of high round count tactical shooters. For discriminating customers further customization and finish work is also available through Wilson Combat. This model is exclusive to Wilson Combat and only available from Wilson Combat and Wilson Combat dealers. Editor’s Thoughts: There is a lot I like about this gun right off the bat, the first thing being the lack of a rail. The current 92FS Compact offering from Beretta is a great carry gun, but I feel like the rail makes it too chunky. This model lacks the rail, preserving the nice lines of the pistol and making it a bit lighter. Additionally, it’s a decock only G model, which is the best possible set-up for a 92-series pistol. Replaceable rear sight means I can swap out the sights for something I may like more, however the Wilson sight that comes on it is an excellent choice. The only thing I wish it had was a tritium front sight instead of a white dot sight. Otherwise, I think $1k out the door for a truly sick carry gun is a pretty fantastic set up. The rest of the gun looks great, but if I’m paying $1k for a carry gun it had better come with night sights. Or, at the very least, the installation of night sights shouldn’t require a milling machine. I do wish they’d gone with a dovetail front, but people have fixing that for so long on Beretta pistols that there’s an entire cottage industry around it.